INDIANAPOLIS, Jan. 27, 2015 - The Indianapolis Motor Speedway and Firestone will honor four-time Indianapolis 500 winner Al Unser during the 45th anniversary of his first Indianapolis 500 victory on Saturday, May 23, 2015, at "Legends Day Honoring Al Unser presented by Firestone." "Fifty years ago I arrived at the Indianapolis Motor Speedway as a rookie, drove for some remarkable teams, raced with my son and brother, drank the milk and my life was forever changed by this special place," said Unser. "I am honored to be named the 2015 Legend and look forward to seeing the race fans and being a part of the events leading up to the spectacular annual Indy 500 Race." Unser, a member of one of racing's most exclusive clubs as a four-time Indianapolis 500 winner in 1970, 1971, 1978 and 1987, will receive special recognition from Firestone during the Public Driver's Meeting and will participate in a question and answer session, which includes allotted time for autographs, with fans later that day on the IMS Pagoda Plaza Stage. "One of the smartest and most competitive drivers in the history of auto racing, Al Unser's amazing career as a driver places him among the greatest ever in his profession," said J. Douglas Boles, Indianapolis Motor Speedway president. "Al has become an iconic figure at the Indianapolis Motor Speedway and is recognized worldwide as one of racing's greatest ambassadors. We all look forward to honoring and thanking him for his endless contributions to our great sport during Legends Day on May 23." Unser holds the record for most laps led (644) in 27 career Indianapolis 500 starts. The 17-year span between his first and last Indianapolis 500 victory (1970-1987) is also an event record. He is one of five drivers to win two consecutive Indianapolis 500-Mile Races and is the oldest driver to win the "500" at 47 years, 360 days old in 1987. Unser's 39 victories in IndyCar competition rank fourth all-time, ahead of his brother, Bobby Unser (35), and son, Al Unser Jr. (34), who rank fifth and sixth, respectively. Unser's 10 wins in 1972 are tied with A.J. Foyt (1964) for the most wins during a single Indy car season. "Legends Day celebrates the storied history of Firestone, the iconic Indianapolis Motor Speedway and the great drivers who solidified their place in history by winning the "Greatest Spectacle in Racing," said Lisa Boggs, director of Bridgestone Americas Motorsports. "The Unser name is synonymous with IMS and the Indy 500, and we are honored to recognize Al and his legendary career." Other featured events on Legends Day include the annual Public Drivers' Meeting on pit road adjacent to the Tower Terrace grandstand, autograph sessions with the Indianapolis 500 starting field of 33 drivers and former Indy 500 drivers, a Indianapolis 500 memorabilia show and it is highlighted by the second annual Legends Day presented by Firestone Concert featuring a yet-to-be announced artist. 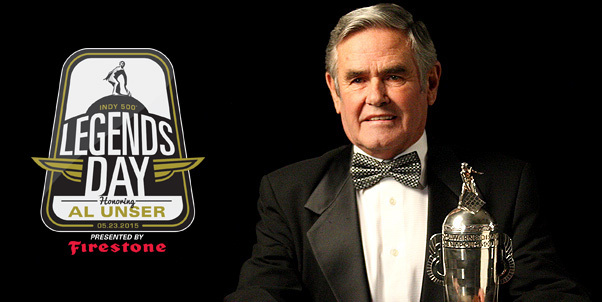 Admission to IMS on "Legends Day Honoring Al Unser presented by Firestone" will be $10 for adults, with children 12 and under free when accompanied by an adult. The 99th running of the Indianapolis 500 is scheduled for Sunday, May 24. 2015 Ticket Information: Ticket information is available for all racing events at the Indianapolis Motor Speedway in 2015 - the Angie's List Grand Prix of Indianapolis, 99th Indianapolis 500, Brickyard Vintage Racing Invitational, Lilly Diabetes 250, Crown Royal Presents the "Your Hero's Name Here" 400 at the Brickyard and Red Bull Indianapolis GP.